This surname is English and sometimes Scottish habitional and derives from residence at a remote valley (halh) or by a salt water estuary (heil). The origin is strictly speaking Ancient British (pre-Roman), and a survivor of the very earliest civilizations. Sometimes the name is locational from villages called Hale, Hales, Haile, and Hayle, which occur throughout the British Isles. 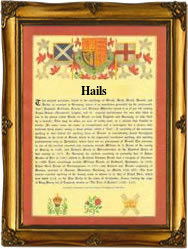 The plural surname spelling forms which include Hails, Hales, Hayles and Hallas (a Yorkshire form), may denote either a patronymic (son of Hayle) or simply that the extra 's' aids pronunciation. Early examples of recordings of the name include: Morus de la Hales, in Kent (1214), John del Hale, of Hertfordshire, in the 1214 Curia Regis Rolls and William Hayles in the Friary Rolls of Yorkshire in 1456. The original Coat of Arms is understood to be one of a red field, charged with the blazon of a gold fesse between two silver chevronels. The crest is a hand holding a torteaux. Among the church recordings are those of James Hayles who was a witness at the christening of his daughter, Anne, at St. Peter's Cornhill, London, on November 15th 1573 , whilst on October 22nd 1580, Johan Hailes (female) married Nicholas Dannyell at Bamfield, Hertfordshire. The first recorded spelling of the family name is shown to be that of William de Hales, which was dated 1180, in the "Pipe Rolls of Shropshire", during the reign of King Henry 11, known as "The Builder of Churches", 1154 - 1189. Surnames became necessary when governments introduced personal taxation. In England this was known as Poll Tax. Throughout the centuries, surnames in every country have continued to "develop" often leading to astonishing variants of the original spelling.